So said the visitor to Ke Awa Lau o Puʻuloa – but he wasn’t speaking of crustaceans, he was speaking of the fishermen he saw as “fat crabs”, that is, a dainty morsel. He was Mikololou, a man-eating shark from the Kaʻū district on the Island of Hawaiʻi. He was part of a large company of sharks who came to visit from Hawaiʻi, Maui and Molokaʻi. Most of these had human relatives and were not desirous of eating human flesh, but among them were some who disregarded the relationship, and learned to like them. Kaʻahupahau, hearing those words, knew at once that some of the strangers were man-eaters. Guardians of the area, she and her brother Kahiʻuka went into action to protect the fishermen. But Kaʻahupahau could not distinguish between the good and the bad sharks; she then she changed into the form of a great net and hemmed in her visitors while the fishermen who answered her signal came to destroy them. Her brother Kahiʻuka struck at intruders with his tail, one side of which was larger than the other; the fishermen hauled in the nets to shore and Mikololou was cast upon the shore with the evil doers, where they were left to die of the intense heat. All but Mikololou were soon dead; though his body died his head lived on and as the fishermen passed to and from their work, his eyes followed them and tears rolled down his face. At last his tongue fell out. Some children playing nearby found it. They picked it up and cast it into the sea. Now Mikololou’s spirit had passed out of his head into his tongue and as soon as he felt the water again he became a whole shark. With a triumphant flop of his tail, he headed for home to join his friends again. When Kaʻahupahau saw him, it was too late to prevent his departure. “Mikololou lived through his tongue,” or, as the Hawaiians say, “I ola o Mikololou i ka alelo.” This saying implies that however much trouble one may have, there is always a way of escape. Kaʻahupahau may mean “Well-cared for Feather Cloak” (the feather cloak was a symbol of royalty). Kahiʻuka means “Smiting Tail”; his shark tail was used to strike at enemy sharks; he also used his tail to strike fishermen as a warning that unfriendly sharks had entered Puʻuloa. Such guardian sharks, which inhabited the coastlines of all the islands, were benevolent gods who were cared for and worshiped by the people and who aided fishermen, protected the life of the seas, and drove off man-eating sharks. Pukui notes Kaʻahupahau in ʻŌlelo Noʻeau: Hawaiian Proverbs and Poetical Sayings, No. 105: “Alahula o Puʻuloa, he alahele na Kaʻahupahau”: “Everywhere in Puʻuloa is the trail of Kaʻahupahau. Said of a person who goes everywhere, looking, peering, seeing all, or of a person familiar with every nook and corner of a place.” Kaʻahupahau was noted for traveling about, vigilantly guarding her domain against man-eating invaders. Puʻuloa also was home to Komoawa, (or Kamoawa,) a large shark who was Kaʻahupahau’s watcher. His cave, called Keaaliʻi, was at the entrance of Puʻuloa. (Thrum, Hawaii-edu) Kualiʻi guards the entrance to Pearl Harbor, while the home of Kaʻahupahau is deeper into Honouliuli lagoon. Years later, the US Navy, having acquired Pearl Harbor, was working to expand the facilities. This included dredging the channel, adding a coal station and construction of a drydock. Merely a coincidence? Some think not. 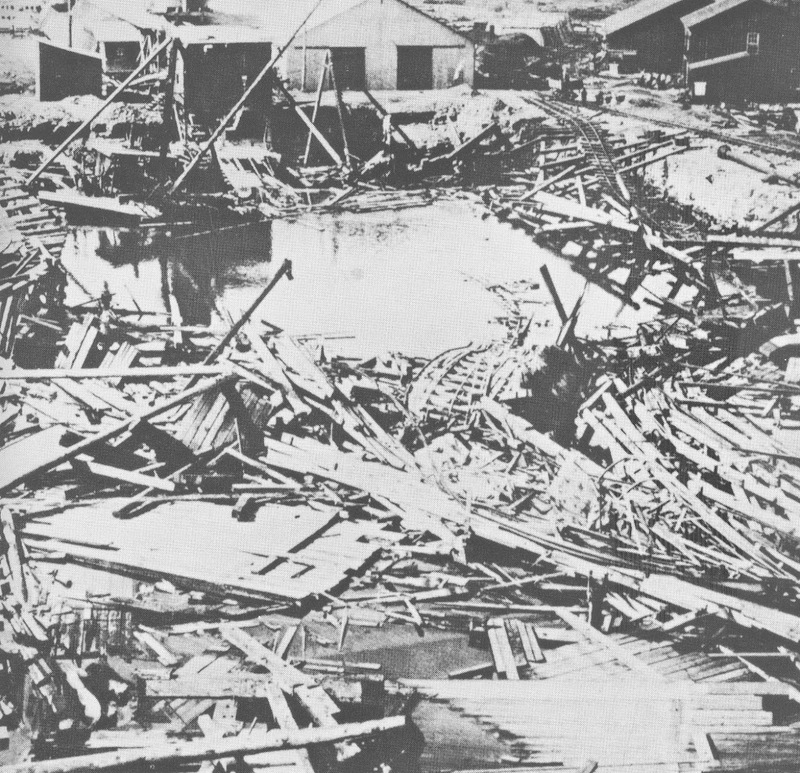 The image shows Pearl Harbor Dry Dock #1, after the February 1913 explosion In addition, I have added other related images in a folder of like name in the Photos section on my Facebook and Google+ pages. During ancient times, various land divisions were used to divide and identify areas of control. Islands were divided into moku; moku were divided into ahupuaʻa. A common feature in each ahupuaʻa was water, typically in the form of a stream or spring. The Island of O’ahu had six Moku: Kona, Koʻolaupoko, Koʻolauloa Waialua, Waiʻanae and ʻEwa. ʻEwa was comprised of twelve ahupuaʻa. Some stories, when first recorded in the 19th- Century, refer to ʻEwa as the first area populated on Oʻahu by the immigrant Polynesians. Puʻuloa or Ke Awa Lau O Puʻuloa (the many harbored-sea of Puʻuloa) is situated here. All water sources in each of the twelve ahupuaʻa of ʻEwa met in Puʻuloa. This was the only moku in all the islands where all waters from its ahupuaʻa did this. Today, we generally call this place Pearl Harbor. Some of the traditional themes associated with this area include connections with Kahiki (Tahiti,) the traditional homeland of Hawaiians. There are several versions of the chief Kahaʻi leaving from Kalaeloa (Barber’s Point) for a trip to Kahiki; on his return to the Hawaiian Islands, he brought back the first breadfruit and planted it at Puʻuloa. Traditional accounts indicate several of the fishponds in the Puʻuloa area were believed to have been constructed by Kāne and Kanaloa. Directing the menehune, they made the pond Kapākule (aka Pākule,) which they stocked with all manner of fish. Puʻuloa was originally an extensive, shallow embayment. Keaunui, the head of the powerful and celebrated ʻEwa chiefs, is attributed for having cut a navigable channel near the Puʻuloa saltworks, by which the great estuary, known as “Pearl River,” was for the first time rendered accessible to navigation. Puʻuloa was regarded as the home of the shark goddess Kaʻahupahau and her brother Kahiʻuka in Hawaiian legends. They were said to live in a cave at the entrance to Puʻuloa and guarded the waters against man-eating sharks. Moku‘ume‘ume (meaning “island of strife”) is a small island located in Pearl Harbor on the Island of Oʻahu. It is entirely surrounded by water deep enough to accommodate deep draft ocean-going vessels. We now call it Ford Island. The first known foreigner to enter the channel of the Pearl Harbor area, Captain George Vancouver, started to explore the area, but stopped when he realized that the entrance was not deep enough for large ships to pass through. In the nineteenth century, the peninsula between Middle Loch and East Loch (part of the Mānana ahupuaʻa) had numerous fishponds, some rice fields, pasture land at the tip, and oyster beds offshore. 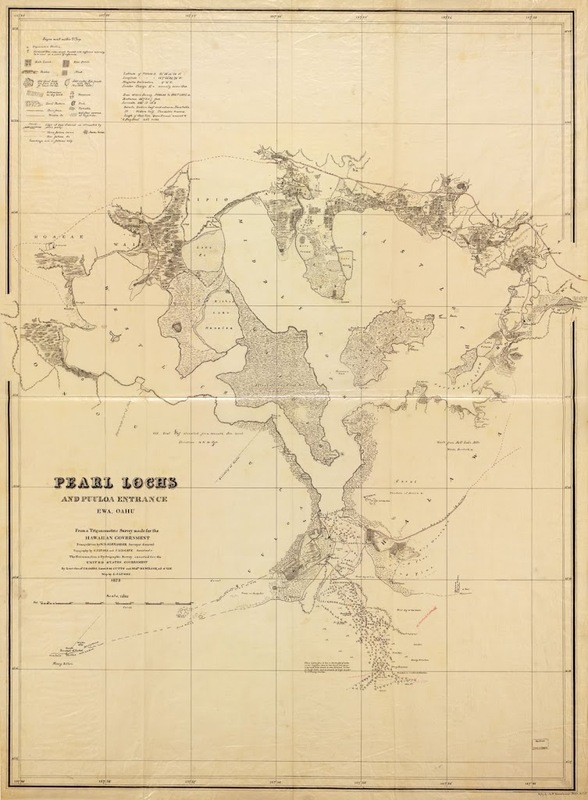 The image shows an 1873 map of Puʻuloa (Pearl Harbor.) In addition, I have added other images in a folder of like name in the Photos section on my Facebook and Google+ pages.